This .40 S&W ammunition from Idaho manufacturer CCI is a cheap, reliable range load with similar ballistics to popular lightweight hollow points with high muzzle velocities. 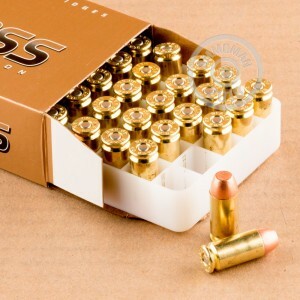 Each cartridge in this box of 50 fires a 165 grain full metal jacket bullet. 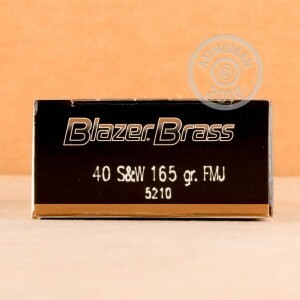 Blazer Brass ammunition uses CCI's own famously reliable primers as well as reloadable brass cases. The latter feature distinguishes this ammo from regular aluminum-cased Blazer ammo. CCI is a sister company of Speer Bullets and a division of Alliant Techsystems/ATK, a major defense contractor and ammo manufacturer. Keep your skills sharp and your costs down with volume ammo purchases from AmmoMan.com! All orders over $99 receive free shipping.